TO end the lingering and back-breaking burden of unpaid workers’ salaries in several states of the country, President Muhammadu Buhari has approved a comprehensive relief package. Sources said, yesterday, that President Buhari okayed a three-pronged relief package including sharing of fresh allocations, granting of soft loans and restructuring of states’ debt-servicing payments. The packages are expected to go into effect this week as the President is said to have directed that release of the funds should be made urgently to assuage the plight of thousands of Nigerian workers in the federal and state governments. 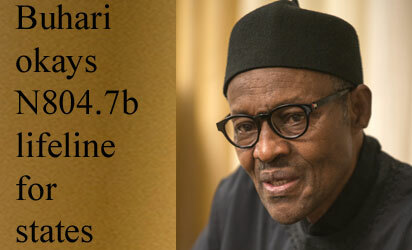 About $2.1b (N413.7bn) will be shared in fresh allocation between the states and the federal government. The money is sourced from recent Liquefied Natural Gas (LNG) proceeds to the federation account. A Central Bank of Nigeria (CBN)-packaged special intervention fund that will offer financing to the states, ranging from between N250bn and N300bn. This would be a soft loan that states could access to pay the backlog of salaries. Implementing a debt relief programme proposed by the Debt Management Office, DMO, which will help states restructure their commercial loans currently put at more than N660bn, and extend the life span of such loans while reducing their debt-servicing expenditures. Also, a total of N391 billion from the Excess Crude Account, ECA, will be shared among the three tiers of government, the Accountant-General of the Federation, Ahmed Idris, disclosed yesterday. With the N413.7 billion LNG proceeds it means the three tiers of government will share a total of N804.7 billion. By extending the commercial loans of the states, according to the third package, more funds would be made available to the state governments, which otherwise would have been claimed at source by the banks. Vanguard gathered that the Federal Government has agreed to use its influence to guarantee the elongation of the loans for the benefit of the states. Sources explained that this package, which was considered at the National Economic Council, NEC, last week, is designed specifically for workers, adding that President Buhari reviewed and approved the package in his bid to intervene and alleviate the sufferings of workers, some of whom have not been paid for over 10 months. Contacted, the Special Adviser to the President on Media and Publicity, Mr. Femi Adesina confirmed the development, adding that the President is deeply concerned about the plight of the workers. While inaugurating the NEC last week, President Buhari asked the council to, as a matter of priority, consider how to liquidate the unpaid salaries of workers across the country, a situation he observed has brought untold hardship to the workers. While the N413bn LNG proceeds would be shared among the three tiers of government using the revenue allocation formula, the CBN will also make available the special intervention fund to states and then negotiate the terms with individual states. At the NEC meeting, the relief measures were extensively discussed between the state governors and top officials of the Federal Government including the CBN governor, and the permanent secretaries from ministries of Finance and Petroleum Resources. Other agencies that were actively involved in the process include the DMO and officials from the Office of the Accountant-General of the Federation, it was learned. Currently, 12 of the 36 states of the federation are owing their workers more than N110 bn. The most affected states are Osun, Rivers, Oyo, Ekiti, Kwara, Kogi, Ondo, Plateau, Benue, and Bauchi. However, sources said the Finance Ministry and the CBN may have pegged the amount needed to settle all the outstanding public workers salaries at about N250 billion. There are also workers in the federal government’s employ whose salaries have not been paid for months and their cases would be taken care of by the new package. On the N391 billion ECA fund, Idris, who was at the Presidential Villa alongside the Permanent Secretary of the Federal Ministry of Finance, Anastasia Daniel- Nwaobia to brief President Buhari on the state of affairs in the ministry, said the Federation Account Allocation Committee (FAAC) would meet to determine sharing formula. Idris took over from Jonah Otunla after his appointment on June 25. Speaking to State House Correspondents, he said what the new regime met on the ground was between the $1.6 to $1.7 billion which is equivalent to N391 billion. Speaking on the outcome of their meeting with President Buhari, he said that the President advised on prudent management of scarce resources. “The general message is clear. Mr. President had a clear direction, and we all have to fall in line; prudent management of resources and identify more alternative ways of generating revenue which we are set to do and to manage the meagre resources we found on the ground very efficiently and effectively for the betterment of the economy,” Idris said. Addressing journalists earlier, the Permanent Secretary Ministry of Finance, Nwaobia also revealed that the meeting with the President was to formally brief him on the state of the nation’s finances. She also hinted that the Central Bank of Nigeria (CBN) and the Budget Office of the Federation were verifying oil subsidy payments. Nwaobia however dismissed insinuations that there was massive looting going on in the ministries due to the absence of ministers, stressing that their absence cannot stall progress in the business of governance. She said: “The state of Nigerian finances is okay. Our finances are okay, though we are still going through challenges of revenue stream to government and this you know obviously is from the oil shock, the price of oil that has dropped. It has significantly reduced the revenue stream to government but we are working on other ways to see how we can shore up the revenue, so that we will be able to meet our expenditure. The bailout package elicited commendations from some eminent Nigerians, who, however, urged our leaders to be prudent in the management of the scarce resources. Those who spoke on the issue included legal icon, Professor Itse Sagay (SAN); former presidential candidate, Professor Pat Utomi and Labour Party scribe, Kayode Ajulo. The legal icon, however, dismissed the notion that the bailout is a sign of weakness on the part of the President. Besides, he said “this development should now make government impose conditionality that will stop mismanagement and unnecessary spendings”. On its part, the Labour Party, which accused the state governors of allegedly mismanaging resources meant to run the states, advised that the bailout funds must be judiciously spent.